Just as art has shaped our thinking, so too has photography. Photography has fought to find acceptance as an art form throughout history. 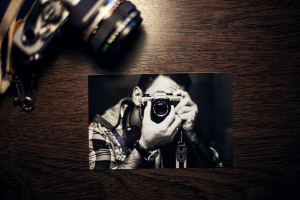 Is Photography a True Art Form? Scholars of art over the centuries have argued over whether or not photography is or is not a true art form. Photography has been questioned as having the ability to create the style of expression ath art does. Artists have been known to convey emotion, opinion, ideology, and religion which is evident in their artwork. Can this be achieved in a photograph? This is where the argument lies as to whether photography is, in fact, an art form. The advancement photography has made through history has aroused popularity within society. Photographers have mastered the ability to capture the attention of people by translating human struggle throughout the world. One could gaze at a photograph and be engulfed with the striking honesty of an event or a subject. Nick Ut (Photographer) took a photo of a young girl in a Vietnamese village just after napalm overtook it. This image stirred emotions in those who peered at the photo. Anger, pity, sorrow, and compassion were only a few of the emotional reactions this photo brought out. The photo depicted a strong message of how useless this war was and the suffering that was inflicted on innocent people as a result of political prowess. 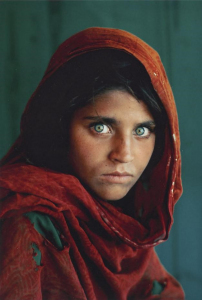 Steve McCurry (Photographer) shot what’s probably the most quintessential photo ever of a young Afghan girl. Her gaze into the camera not only penetrated the lens but Steve’s heart as well. The camera caught the image of a twelve-year-old orphan girl at a refugee camp in Afghanistan. Steve saw the girl amidst the swirling dust sitting all alone conveying her plight ever so silently. Little did he know this photograph would appear in magazines and be the center of news. Photography has served as the agent for change bringing awareness of human experiences as well as the need for social progress. Photographs speak the truth of the condition of humanity in our world. 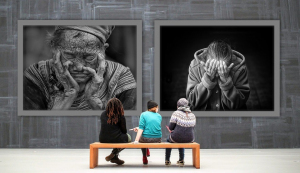 Photography has undoubtedly left a footprint within the art culture and has found its place of acceptance among those that disputed its credibility as a true form of art.